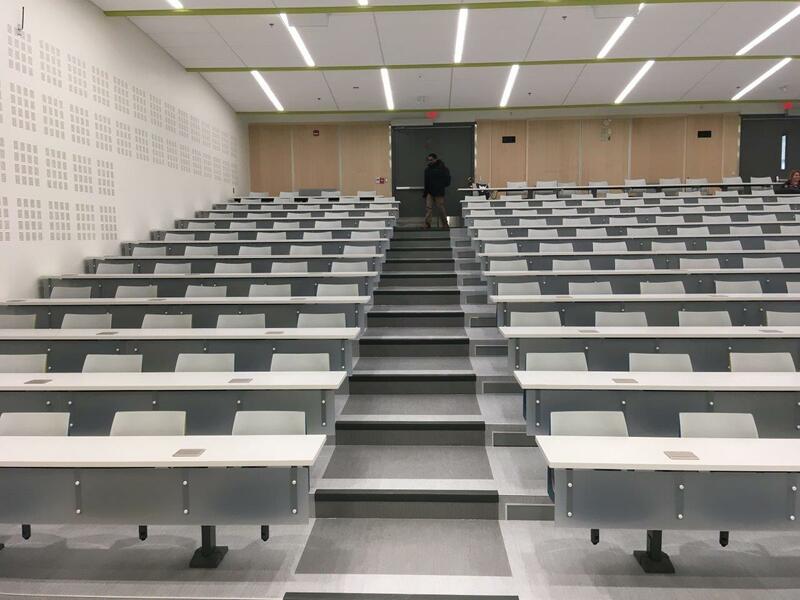 University of Manitoba Lecture Theatre – 290 Education – Epp Siepman Engineering Inc. 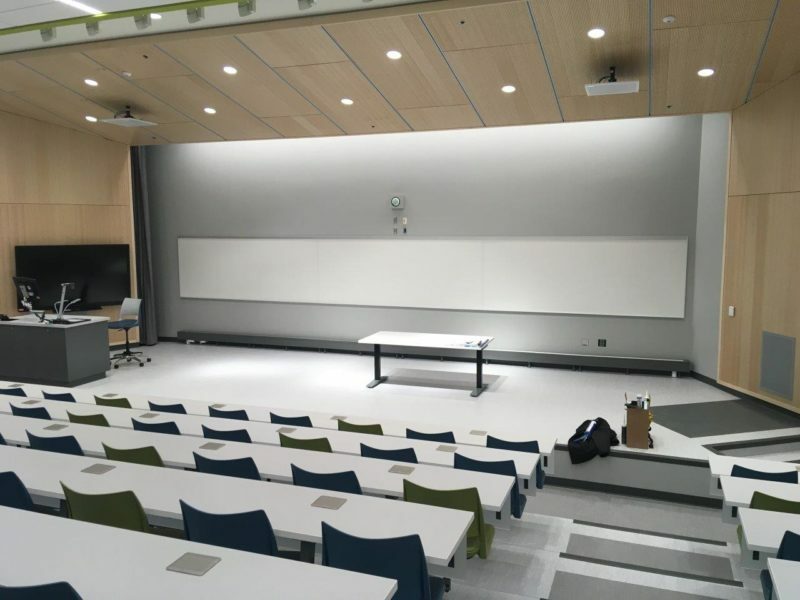 This renewal of the largest and most utilized lecture theatre on campus at 290 Education replaced the finishes, HVAC, lighting, controls, acoustics, and audio/visual systems to support the growing needs for the facility. 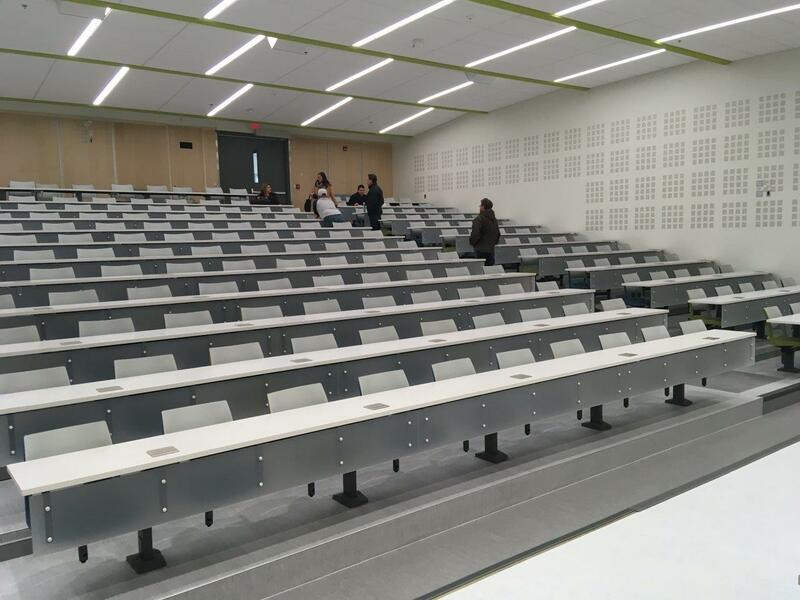 Finishes were carefully selected and placed to control the acoustic environment for both students and lecturers. The original HVAC system was completely replaced with a new displacement ventilation system delivering fresh outdoor air through the tiered theatre seating at the level of each occupant. The new air handling unit recovers exhaust air energy at 85% efficiency and utilizes CO2 demand-control to minimize fan energy. A new perimeter hot-water heating system covers envelope and non-occupied heating losses without requiring further fan power. The new HVAC systems provide improved thermal comfort, increased ventilation efficiency, and a quieter system while saving on energy inputs. Audiovisual (AV) and electrical systems were upgraded to support new teaching technologies complete with an addressably controlled LED lighting system for integration with AV systems. The new design enables the presenter full control through a single touchscreen located at the podium. The entire lighting system was upgraded with LED lighting and variable lighting levels to accommodate video recording. Network lighting controls were used to allow for specific preset lighting settings which communicate with the AV systems to automatically control and dim the lighting depending on the presentation. Multiple screens and displays accommodate the different content for each of the user groups. Microphones and assistive listening devices accommodate individuals with hearing impairment. This integration of all the systems is crucial for all the different users, mobile and personal devices to work seamlessly together and provide a effective and versatile learning experience.